Mastery of life is mastery of yourself. This is something that can be achieved by each and every individual, but it takes careful mindfulness, attention to your inner dialogue, and most of all, patience. Each Soul moves through cycles of incarnating again and again, learning things all along the way. During that process you also transform some of the energy you held onto from previous lifetimes, completing those specific lessons. In your life now, you still retain all of the memories and experiences, and you can draw from them in different ways. Sometimes, that is by transforming the pieces you no longer want to carry, and other times, it is by playing up the expertise and experiences from before. When all of your experiences, expertise, and challenges line up together, they give you information about what you are here to do in your life now. That is what you call your life purpose. On a larger scale, your Soul also has a mission, a mission carried through all of your past lives and into this one. As you learn more about yourself, your Soul mission changes slightly, adding and subtracting small bits to forge something that is unique to you. Your Soul mission is not defined by the job you have, instead it is the role you play in the theater of life. That role can morph and change, but the central motivation for that role will remain the same. Think about the things in life that motivate you; compassion, transformation, positive change, education, spiritual growth, etc. Find the number one motivator in your life, the top activity or topic that makes you excited when you put your time and energy into it. It can be anything! Whatever that number one motivator is, it reveals a very important piece to your Soul mission. When your Soul Mission combines with your life purpose, it creates a beautiful, changeable life experience. For example, if your Soul Mission is compassion, there are many different life purposes that can derive from it; such as, teaching, animal welfare, health care, childhood development, advocacy work, counseling, parenting, working in service, and so much more. As you move through the phases of your life, you may encounter different facets to your life purpose. Let’s use the example of parenting as a life purpose. Perhaps as a child, you loved to take care of dolls or stuffed animals, having them represent your make-believe children. Then as a young adult, you have your first child, and discover a sense of purpose, stirring not only unconditional love, but also something deeper, a feeling that this is your place in the world. You have more children, and as your children grow up, you might start to reflect and do some writing on how you are raising them. Soon, you are blogging about your experiences, and an online magazine picks up your blog. Then, you are asked to speak to parenting groups and appear on parenting-related programming. Before you know it, your children have become adults themselves, but you are still sharing your wisdom and guidance with other parents as a parenting expert, continuing to do so until you decide to retire and simply enjoy being a grandparent. 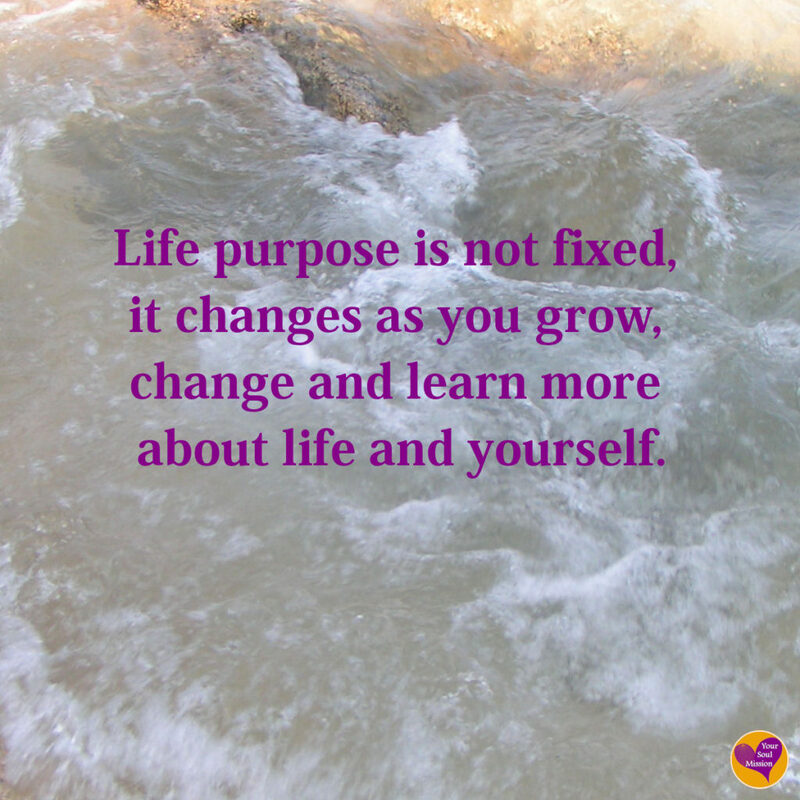 Life purpose is not fixed, it changes as you grow, change and learn more about life and yourself. Your Soul Mission and life purpose work together, giving you a stance for your life purpose. In using the example above, the life purpose of parenting would have the stance of compassion and care. While another individual with a Soul Mission of education, could still have a life purpose of parenting, but that individual’s life purpose of parenting would have the stance of education. Each and every individual on the planet is unique, and your uniqueness is reflected in your Soul Mission and life purpose. By reflecting on, and understanding all of the pieces of who you are, from past lives, present experiences and by shifting into a Soul perspective, you are able to put together more and more pieces of the puzzle that is you. The more knowledge you gain about yourself, and the more past life patterns you transform, the more you gain self-mastery and begin living your Soul Mission. When you are ready to learn more about the Past Life Patterns you hold (and how to transform them), take the Past Life Quiz.